theoretically, space without matter in it. A perfect vacuum has never been obtained; the best human-generated vacuums contain less than 100,000 gas molecules per cc, compared to about 30 billion billion (30×1018) molecules for air at sea level. machine that decreases the volume of air or other gas by the application of pressure. Compressor types range from the simple hand pump and the piston-equipped compressor used to inflate tires to machines that use a rotating, bladed element to achieve compression. ..... Click the link for more information. are used to pump air or other gases into a closed container. They range from hand pumps to large power-driven devices that furnish compressed air for operating pneumatic machinery and for various other purposes. In nuclear reactors that use liquid radioactive metal, the nonmechanical electromagnetic pump is employed. An electric current is either induced in the liquid metal or is passed through it by electrodes. A magnetic field surrounding the pipe then propels the current-carrying liquid forward. a device (hydraulic machine, apparatus, or instrument), used to displace a fluid (usually a liquid) under suction or discharge pressure by imparting external potential or kinetic energy to it. Devices for nonpressured displacement of liquids are usually not called pumps; they are classified as water-lifting devices. The main parameter of a pump is the quantity of liquid displaced per unit time—that is, the actual volumetric capacity Q. The following technical parameters are also very important for most pumps: the pressure produced p or the corresponding head H, the input power N, and the efficiency η.
Terminology. The designation of most devices used for suction or delivery of liquids consists of the word “pump” and the appropriate definition, which usually characterizes the principle of operation (for example, centrifugal or electromagnetic), the design features (horizontal, gear, or sliding-vane), or the medium being pumped (mud pump). Sometimes the defining term designates the application (as in “laboratory pump” or “metering pump”), the type of drive (manual or electric drive), the designer (the Humphrey pump), or the name of a firm (the SIHI pump, showing the first letters of the words Simen Hinsch, or the Farko pump, after the name of the plant owner). Some of the devices described here are known by special names. For example, one type of gas lift is called an airlift (Russian mammut-nasos); the displacement pumps, which include the monte-jus, are also called pneumatic airlift pumps; and the hydraulic elevator, injector, and ejector are varieties of the jet pump. The designation “pump” is also applied to devices used in an entirely different way. Examples are vacuum pumps, which are used for removal of gases from enclosed spaces; heat pumps, which transfer heat from a medium with a low temperature (air or water) to objects at a higher temperature (for example, the water of a heating system); and magnetic-flux pumps, which produce a periodic change in the magnetic flux in a closed circuit. Classification. Devices for pressured displacement of liquids are classified by type and variety according to various features, such as principle of operation or design. Such principles are the basis of classification in the All-Union State Standard of the USSR (GOST 17389–72). Pumps may also be classified arbitrarily into two groups: power pumps, which are driven by engines, and direct-acting pumps, which are actuated by other energy sources and have no moving parts. Power pumps may be of the vane type (centrifugal, axial, or turbine), the piston type, or the rotor type (spur-gear, rotary, plate, and screw types). Direct-acting pumps include jet pumps (liquid-to-liquid or gasto-liquid pumps), gas lifts (including airlifts), gas and vapor displacement pumps, hydraulic rams, and magnetohydrodynamic (MHD) pumps. All types and sizes of pumps made in the USSR have conventional brand designations, which usually consist of letters and numerals. History. The pump was invented in remote antiquity. The first pump for extinguishing fires (see Figure 1), which was invented by the ancient Greek mechanical engineer Ctesibius, was described in the first century B.C. by the Greek scientist Hero of Alexandria in his treatise Pneumatica and later by Vitruvius in his work De architectura. Very simple wooden pumps with a straight-through plunger were probably used even earlier to lift water from wells. Until the beginning of the 18th century, reciprocating pumps were used much less frequently than water-lifting devices. Later, however, pumps gradually replaced water-lifting devices as a result of an increase in demand for water and the necessity of increasing the height to which water was raised, particularly after the advent of the steam engine. The demands made on pumps, and also the conditions under which they were used, became increasingly diverse. Therefore, rotary pumps, as well as various other devices for delivery of liquids under pressure, came into use in addition to reciprocating pumps. Thus, three historical trends in the subsequent development of pumps became apparent: the construction of reciprocating pumps, rotary pumps, and hydraulic devices without moving parts. Intensified development of reciprocating pumps took place in the late 18th century, when metal was introduced as a material for their manufacture and the steam engine was used as a pump drive. In the mid-19th century direct-acting steam reciprocating pumps came into widespread industrial use. The first vane pumps were built during this period. The prototype of this pump design is a reciprocating pump with an annular cylinder, described by the French engineer A. Ramelli in 1588 (Le Diverse et Articiose Machine). The development of the theory of reciprocating pumps is closely associated with the work of Russian scientists and engineers (K. Bakh, G. Berg, A. P. German, V. G. Shukhov, P. K. Khudiakov, I. I. Kukolevskii, and A. A. Burdakov). Advances in the area of reciprocating pumps have been widely used in the design of reciprocating compressors, hydraulic presses, and other equipment. However, since the 1920’s and 1930’s, reciprocating pumps themselves have gradually been replaced by centrifugal, rotor, or other types of pumps in many areas of use. A different trend in pump development began with the invention of rotary pumps with a single rotor, which also were described by Ramelli. The pump with an eccentric rotor is the prototype of modern sliding-vane pumps. In 1624, in his La Recreation mathé matique; I. Leyrehon described a two-lobe rotary pump (see Figure 2), which may be regarded as the prototype of modern gear pumps. Other varieties of rotary pumps appeared subsequently, among them the labyrinth pump (designed as late as the 1950’s). The first vortex pump, called a centrifugal self-priming pump, was proposed by the German engineer S. Hinsch in 1920; other types appeared later. In the 15th century, Leonardo da Vinci conceived the idea of using centrifugal force for delivery of liquids. The idea was put into practice (apparently independent of Leonardo) by the French engineer Blancanot (early 17th century), who built a very simple centrifugal water pump (see Figure 3), whose working member was an open, rotating wheel. 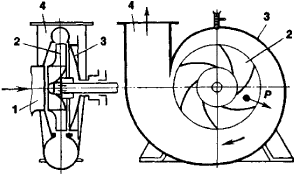 One of the first centrifugal pumps with a spiral casing and a four-vane impeller (see Figure 4,a) was proposed by the French scientist D. Papin, who improved the design of the existing Hessians air blower (see Figure 4,b). Centrifugal pumps became more widely used toward the end of the 19th century when high-speed thermal engines and then electric motors became available. In 1838 the Russian engineer A. A. Sablukov built a single-stage centrifugal pump, whose design was based on that of an air blower that he had developed previously. In 1846 the American engineer Johnson proposed a multistage horizontal pump; in 1851 an analogous pump was built in Great Britain in accordance with a patent by Gwynn (Gwynn’s pump). In 1899 the Russian engineer V. A. Pushechnikov developed a vertical multistage pump for wells up to 250 m deep. The pump was built in Paris at the Farko plant (the Farko pump) and was intended for the water-supply system of Moscow. It had a capacity of 200 m3/hr and an efficiency of up to 70 percent. The first centrifugal pumps built in Russia were made in 1880 at the plant of G. List in Moscow. The development of axial pumps was based on experience gained from the analogous hydraulic turbines. Work on the design and study of axial (propeller and rotary-vane) pumps was conducted at the turn of the 20th century. In the USSR the development of such pumps began in 1932 at the Borets Plant (under the direction of M. G. Kochnev), the All-Union Research Institute of Hydraulic Machine Building (S. S. Rudnev), and the Promenergetika Kharkov Institute (G. F. Proskura), and since 1934 at an experimental plant in the city of Dmitrov (under the guidance of I. N. Voznesenskii). The work of L. Euler, O. Reynolds, N. E. Zhukovskii, S. A. Chaplygin, C. Pfleiderer, and other scientists was of great importance in developing the theory and improving the design of centrifugal and axial pumps. The third trend in the development of devices for delivery of liquids under pressure combined several different approaches to the design and improvement of pumping apparatus. According to Hero, prototypes of displacement pumps were known even in ancient Greece (in these devices water was displaced from the vessel by heated air or water vapor). The first displacement pump for industrial use was a steam pump installation for sewage proposed by the English engineer T. Savery in 1698. It may be considered a prototype of the pulsometer, which was invented in Germany in 1871 by Hull. The pulsometer had two chambers and operated automatically. 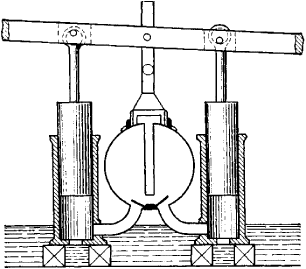 The idea of using compressed air to convey water was discussed in 1707 by Papin and other engineers, but it came into practical use much later (in the 20th century) in the monte-jus and the two-chamber displacement water lift for boreholes (designed by the engineer V. P. Savotin, USSR). The pumping of water by the pressure of products of combustion of liquid fuels was achieved in Great Britain by N. L. Humphrey in 1911. 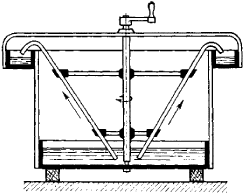 An entirely different principle for conveying water or oil from boreholes by means of compressed air or other gas was used in gas lifts, which were proposed in the mid-19th century, and later found practical application (in Russia since 1897 in the oil fields of Baku; in the USA since 1901). After Montgolfier’s invention of an automatic hydraulic ram (in 1796), another path of development of devices for pressured conveying of liquids became apparent. Such devices used periodically created hydraulic shocks to produce a flow of water. Several other designs of hydraulic rams were subsequently proposed. Installations designed by the engineer D. I. Trembovel’skii (1927) and others are widely used in the USSR. A variety of direct-acting pumps is the water-jet pump, which was proposed as a laboratory device by the English scientist D. Thompson in 1852 and was used as a suction pump for air and water. The first industrial jet pump was used in 1866 by the engineer Nagel (presumably in Germany) to remove water from mine shafts. Various jet pumps were later developed as hydraulic and steam-water injectors. 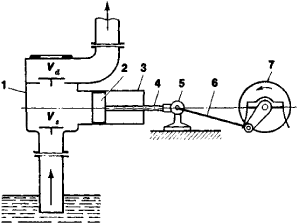 The fundamentals of jet-pump theory were given in the works of G. Zeiner and W. Rankine in the second half of the 19th century and were considerably developed in the 1930’s through the research of the American engineers O’Brien and Goslin and the Soviet specialists L. D. Berman, K. K. Baulin, A. N. Lozhkin, E. Ia. Sokolov, and N. M. Zinger. A hydropneumatic water-lift device for boreholes was subsequently proposed by V. P. Sirotkin and Ia. S. Suren’iants: its design combines a jet pump and an airlift. Another area in the development of direct-acting pumps is the construction of MHD pumps. The first such pumps, operating on direct current, were proposed by Golden (1907) and Hart-mann (1919); a pump operating on alternating current was proposed by Chubb (1915). However, they became widely used in the USSR and abroad only in the 1950’s and 1960’s; they found applications mainly because of advances made in nuclear power engineering. Thus, the technology of lifting and displacing, first applied to water only and then to oil and other liquids, basically corresponded at each stage of development to the level of development of productive forces and production relationships. Main types of modern pumps. Centrifugal pumps are the most common type. They are used for delivery of cold or hot water (t° > 60°C), viscous or corrosive liquids (acids and alkalies), sewage, or mixtures of water and soil, ash, slag, peat, or crushed coal. The operation of a centrifugal pump is based on the transfer of kinetic energy from a rotating impeller (see Figure 5) to the particles of liquid that are between its vanes. 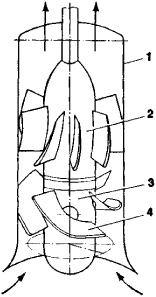 Under the action of the resulting centrifugal force P, the particles of the medium being pumped pass from the impeller to the pump casing and from there to the discharge. The particles that have left the impeller are replaced by new particles, which are moved by air pressure, thus providing continuous pumping. 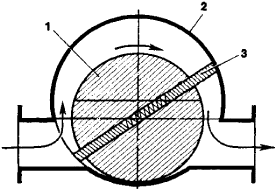 Pump impellers may be of the single-suction type (see Figure 5) or the double-suction type. Use of double suction makes possible almost complete equalization of the pressure of the liquid on the external lateral surfaces of the impeller. 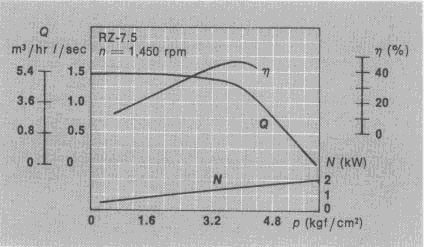 An important practical characteristic of impellers in centrifugal and some other types of pumps is the specific speed ns which is the number of revolutions per minute (rpm) at which an impeller that is geometrically similar to the one being considered develops a head H = 1 m at a flow rate Q = 75 liters per second. A classification of impellers of centrifugal pumps by speed is given in Table 1, where each impeller type is characterized by the ratio of the outside diameter Dout to the diameter of the intake aperture Dap. Vortex (turbine) pumps have ns < 50 rpm; the region ns = 400–1,500 rpm corresponds to axial pumps, as well as mixed-flow pumps, which occupy an intermediate position between centrifugal and axial pumps. operating conditions at first increases with capacity to a maximum value and then decreases upon a further increase in capacity. The largest centrifugal pumps built in the USSR are capable of delivering water at up to 65,000 m3hr at a head of 18.5 m, with power consumption of 7.5 megawatts (MW) and efficiency of 88–92 percent. A vertical single-stage centrifugal pump with a capacity of 138,000 m3/hr at a head of 95 m and a power consumption of 48 MW has been built for the Grand Coulee pumping station in the USA. Axial pumps are used mainly for delivery of large volumes of liquid. Their operation depends on the transfer of energy imparted to the liquid by the force of the front surfaces of the rotating impeller vanes (see Figure 7). At first, the particles of the liquid being pumped have curved trajectories. However, after passing through the straightening apparatus they move in the general direction from the intake to the discharge, mainly along the axis of the pump (hence the name). There are two main types of axial pumps. The fixed-vane type has vanes permanently fastened to a bushing on the impeller and is called a propeller pump. Rotating-vane pumps are equipped with a mechanism that changes the pitch of the vanes. Both types are usually single-stage, and less frequently two-stage. A change in the pitch of the vanes makes possible regulation of capacity but maintains high efficiency within a wide range. The impellers of axial pumps operate at high specific speeds (ns = 500–1,500 rpm). 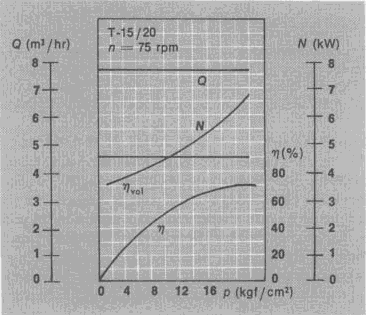 At low capacities the H-Q and N-Q characteristics decrease sharply. The maximum values of H and N correspond to idling. The largest axial rotating-vane pump made in the USSR is designed for Q = (45–50) × 103 m3/hr, at H = 13–10 m, N = 2 MW, and rj = 86 percent. The type designation for this pump is OP2–185, where OP stands for “axial rotary-vane,” 2 denotes the type of impeller, and 185 is the impeller diameter (measured across the vane ends, in cm). Vortex pumps have good self-priming capacity—that is, the ability to start without first filling the suction pipe with the medium to be pumped if the pump casing contains the medium. Because of this property they are used to pump volatile or gas-saturated liquids, as well as in combination with centrifugal pumps. There are two types of vortex pumps—the open type and the closed type. In a closed pump (see Figure 8), particles of the liquid move under the influence of centrifugal force from compartments at the periphery of the impeller to a channel in the pump casing. Then, after transferring part of their kinetic energy to the medium being pumped, which is in the channel, the particles of the liquid return to other compartments. While each particle of liquid is in the pump, it moves in a helical vortex, passes repeatedly into the rotor compartments, and receives a certain energy from the rotor. As a result of this multistage action, vortex pumps develop a head that is 3–7 times greater than the head developed by comparable centrifugal pumps of the same size, operating at the same speed of rotation. However, the efficiency of vortex pumps is 2–3 times lower than that of comparable centrifugal pumps. In vortex pumps of the open type, the liquid is fed in near the pump shaft, passes between the impeller vanes, and is carried to the discharge opening of the casing through an open peripheral channel (a channel without a divider). 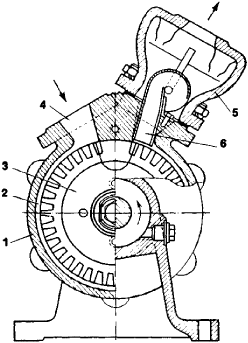 In the foreign literature, vortex pumps are also called friction, regenerative, turbulent, or self-priming pumps. 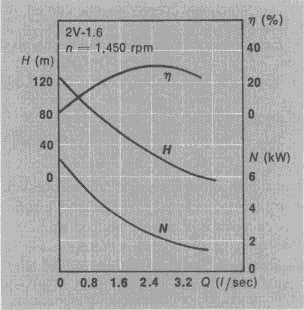 The characteristics of a vortex pump are shown in Figure 9. Reciprocating pumps are distinguished by their great variety of designs and wide range of applications. The operation of such pumps consists of alternating suction and discharge processes, which take place inside the cylinder and result from the motion of the working member (a piston or plunger). The processes take place within the same volume but at different times. In terms of the method used to impart reciprocating motion to the working member, reciprocating pumps are classified as power pumps and direct-acting pumps (power pumps usually incorporate a crankshaft-connecting-rod mechanism). Suction and discharge valves are provided to connect the working volume alternately to the suction and discharge sides of the pump. During operation, the liquid receives mainly potential energy, which is proportional to the discharge pressure. The nonuniformity of delivery of reciprocating pumps, which is associated with the change in the velocity of motion of the piston or plunger over time, decreases as the frequency of strokes increases; it can be almost eliminated by the use of an air-hydraulic equalizer. Reciprocating pumps are classified as horizontal and vertical, single-action (Figure 10) or multiple-action, and single-cylinder or multicylinder pumps. They are also classified according to speed and type of liquid pumped. Reciprocating pumps are of more complex design than centrifugal pumps; they also run at slower speeds and therefore have larger outside dimensions and a larger ratio of weight per unit work performed. However, they have relatively high efficiency, and their capacity (in principle) does not depend on the head (see Figure 11). The latter property makes reciprocating pumps suitable for metering applications. Such pumps are capable of producing discharge pressures on the order of 100 meganewtons per sq m (MN/m2), or 1,000 kilograms-force per sq cm (kgf/cm2). Rotary pumps have been used mainly for low-capacity applications. A distinction is made among gear (including spur-gear), screw, sliding-vane, lobar, axial- and radial-piston, and labyrinth pumps, depending on the design of the working member. Each type includes several designs, but all designs use the same principle of operation (basically analogous to that of reciprocating pumps). Rotary pumps are distinguished by the absence of suction and discharge valves, which simplifies their design and represents a significant advantage. the other gear (see Figure 12, left side), and delivery takes place as the teeth engage (Figure 12, right side), assuming clockwise rotation of the upper gear. Gear pumps are equipped with a safety valve, which passes the liquid from the discharge side to the suction side when the maximum permissible pressure is reached. 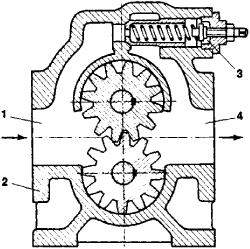 The characteristics of one type of gear pump are shown in Figure 13. Gear pumps are used in the pumping of oil products and other liquids that are free of abrasive impurities. The operation of a sliding-vane pump (see Figure 14) is the result of changes in the working volumes enclosed by adjacent vanes and the corresponding surface areas of the pump rotor and casing. If the eccentrically mounted rotor turns clockwise, the working volume in the left part of the pump increases; therefore, the pressure decreases, and suction of the liquid is produced. In the other part of the pump the space between the vanes decreases as the rotor turns, producing discharge of the medium being pumped. Such pumps may be single-acting or twin. They are used for pumping low-viscosity pure mineral oils under pressures of 6 MN/m2 (60 kgf/cm2) or more, and also in hydraulic drive systems. Jet pumps feature the widest range of use and the greatest variety of design of all pumping devices. An example is the water-jet pump, whose operation consists mainly of three separate processes: (1) conversion of the potential energy of the working fluid to kinetic energy (the conversion takes place in the conically tapered nozzle), (2) exchange of momentum between the particles of the working fluid and the medium being pumped (in the mixing chamber), and (3) conversion of the kinetic energy of the mixture of working fluid and the medium being pumped to potential energy (in the diffuser). As a result, a rarefaction is produced in the mixing chamber, providing for suction of the medium being pumped. The pressure of the mixture of working fluid and the medium being pumped then increases significantly because of a decrease in the velocity of motion, creating the conditions for discharge. Jet pumps are of simple design and are reliable and durable, but their efficiency does not exceed 30 percent. Areas of use. The design features and principles of operation of various kinds of pumps determine the ranges of capacity and head for which a particular type of pump is suitable. The ranges of use of the three basic types of pumps are characterized by the data in Table 2.
steam engines) through special high-pressure water lines to industrial enterprises and other consumers. Since the early 20th century, centrifugal and rotary pumps have been used as generators of hydraulic power in hydraulic machine transmissions and hydraulic machine drive systems, in which the pumps, together with hydraulic engines, are main components. Nasosy: Katalog-spravochnik, 3rd ed. Moscow-Leningrad, 1960. Karavaev, A. E. Ocherk po istorii razvitiia lopastnykh nasosov. Moscow-Leningrad, 1958. Golubev, A. I. Labirintnye nasosy dlia khimicheskoi promyshlennosti. Moscow, 1961. Lomakin, A. A. Tsentrobezhnye i osevye nasosy, 2nd ed. Moscow-Leningrad, 1966. Chiniaev, I. A. Rotornye nasosy. Leningrad, 1969. Of a parametric device, the source of alternating-current power which causes the nonlinear reactor to behave as a time-varying reactance. A machine that draws a fluid into itself through an entrance port and forces the fluid out through an exhaust port. A device or machine that compresses and/or transports fluids, usually by pressure or suction, or both; may be used to remove water from a construction site or to convey water from one elevation to another. See water pump.